Every Child….Every Year. Children’s Eye Exams are Important. Covered by Alberta Health Care once a year. Learn more. Routine eye exams by an optometrist are important to ensure that your child is seeing and performing their best at school. Uncorrected vision problems can lead to headaches, excessive day dreaming, struggling to keep up at school and poor reading comprehension. Kids should have their first eye exam by the age of 3. If you or your child’s pediatrician has any concerns or there is a strong family history of eye problems, our optometrists will happily see patients of any age – even babies! If your child does require eyeglasses, eye-bar carries a complete line of eyewear for infants and toddlers. These indestructible, child proof frames are great for small active children. The larger sized frames within this collection are also a great option for older children and can be easily worn under hockey helmets, for improved safety, vision and comfort. teenagers ages 12-18, please visit our Teenage Eye Exam section. A very special program called Eye See… Eye Learn provides one pair of FREE eyeglasses to children in Kindergarten if they are prescribed by an eye doctor. Eye See… Eye Learn is provided by the Alberta Association of Optometrists, the Government of Alberta, and eye-bar optometrists to ensure all kids have the vision correction required to see, learn and excel in school. 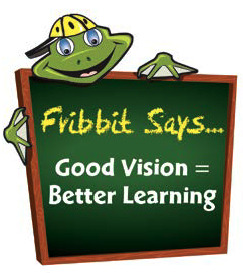 Consider this fact: 25% of grade school children have vision problems that limit their potential and that 1 out of every 4 children begin grade one with an uncorrected or undiagnosed eye health or vision problem. If your child is entering or enrolled in kindergarten, look for the Eye See...Eye Learn package in your child's welcome package. Book an eye exam for your child with an eye doctor at eye-bar. Every kid should have regular annual eye exam by an optometrists (these eye exams are covered through Alberta Health Care - there is no cost to you). Routine eye exams by an optometrist are essential because kids rarely complain about vision problems as they assume everyone sees like them. For example: A child with excessive farsightedness may easily spot a Toys R’ Us sign a mile away, but struggle with reading or seeing the puck in a hockey game. Uncorrected vision problems such as this can lead to headaches, excessive day dreaming, struggling to keep up at school and poor reading comprehension. Beyond testing a child’s visual system, routine eye exams may identify weaknesses and health issues that need to be addressed during important developmental years. Until we reach our 20s, our eyes let in way more damaging light then older eyes. Ultraviolet light is the main culprit (primary sources are the sun and reflected sunlight on water, sand, snow and roads). This makes sunglasses essential for protecting young eyes. Every child should have a pair of quality UV-400 protective sunglasses.